Oneonta Police Explorer Post 2400 was established in 2010 in association with the Boy Scouts of America. Explorer Post 2400 is sponsored by the Oneonta Police Department as a community based policing program. This successful program is designed to educate and involve young men and women in police operations and to interest them in law enforcement functions whether they enter the law enforcement field or not. As an Explorer, young adults have the opportunity to assist the Oneonta Police Department. Explorer’s can broaden their understanding and firsthand knowledge of the challenges and job skills that make up their community's police service. In addition to gaining a working knowledge of police work, the participants have the opportunity to give of themselves to their community. 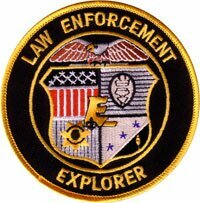 Although Post 2400 is law enforcement oriented, an Explorer is a volunteer and does not serve as police employees, sworn or civilian. The Explorer Post meets twice a month on Tuesday nights from 6:00 to 8:30 at the Oneonta Police Department. Each meeting, Explorers’ have the opportunity to learn how the different divisions of the police department function. Explorers’ have participated in presentations from Detectives, K-9 Unit, Narcotics Unit, Crime Scene Investigators, DUI Enforcement, and other specialty units. Candidates must reside or attend high school in Blount County. Candidates must be in good standing with their schools and maintain a “C” grade point average during their tenure as an Explorer. Each candidate must pass a background investigation. Candidates must be free of any arrest or other criminal background and be of good moral character. A review by advisors and explorers staff will be conducted after the third meeting. Candidates meeting the requirements set forth by the Oneonta Police Department, will be invited the become an Oneonta Police Explorer. 100% meeting attendance is expected, absences must be pre-approved 24 hours in advance by a post advisor. Candidates will be expected to follow all post rules and bylaws. The Explorer functions as a professional, cohesive unit. We attempt to instill a sense of brotherhood and camaraderie into candidates and teach them life lessons that they will carry with them for their entire lives no matter what their final career choice is. Candidates will participate in various exercises that will teach problem solving and critical thinking skills. Candidates will also participate in community based outings and may have the opportunity to travel to the National Explorer Convention. Explorers will have the opportunity to compete in contest not only against each other but against other Explorer Posts. These contest may be anything from real life scenario based training in traffic stops, domestic violence, accident investigation and shooting competitions to name a few. If you want more information please contact the Oneonta Police Department at (205) 625-4351 or by inquiring in person at the Oneonta Police Department.